Glaucoma. 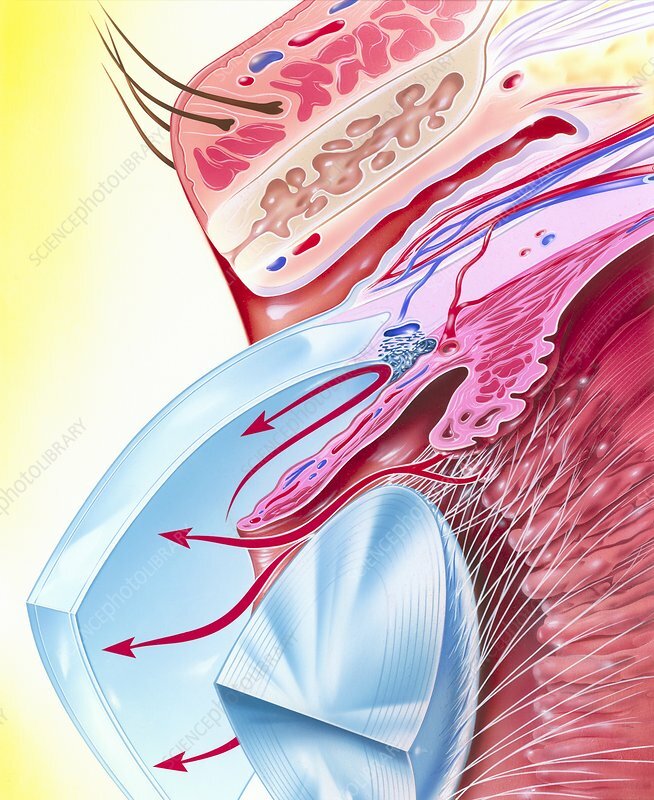 Artwork showing the flow of aqueous humour (red arrows) in the eye in glaucoma. Aqueous humour is fluid produced by the ciliary processes surrounding the lens (lower centre). Normally this fluid passes into the anterior chamber where it drains away via the Canal of Schlemm (centre). Glaucoma is an increase in pressure within the eye, usually resulting from a defect in the drainage of the aqueous humour (arrow turned back on itself). This may be due to infection, trauma or other causes. It can cause of blindness. Treatment is by drugs to control the pressure, or surgery to drain the excess fluid.